Is Irish-Lotto a Scam or Legit? Read 2 Reviews! You gotta love it the way some of these providers try and make their deal look a little better than other lottery service providers. Irish-lotto.com says there is no markup on the ticket price. They say the cost of a player’s subscription cost includes the actual ticket cost plus the weekly membership charge and credit card charges. Duh! Let me explain. Irish-Lotto.com is an online lottery service provider for the Irish Lottery games, US Powerball and Mega Millions. Players can play their favorite numbers or go for a quick pick (randomly picked numbers). They say no one will know that you have bought a ticket or that you have won. What they don’t seem to remember is that with Irish Lottery games, Powerball and Mega Millions – the player has to submit a claim form for any big jackpot win and the winner’s name is public property. Players subscribe for 4, 8 or 16 draws at a time with an amount over and above the face value of the lottery tickets. This is simply what all online lottery providers do. I’m not sure why they think this makes them different. Obviously, in creating an online lottery service, they want to make some money and get paid for doing their job. I did wonder how much goes to the credit card charges. The other thing that made me chuckle is the fact they say entry fees include postage. Like why am I going to expect something in the mail from them? It’s interesting that they say winners will be paid within 48 hours. From our research, no lottery pays out that fast. Most of Irish-Lotto.com’s site is promoting the Irish Lotto which is tax-free. Winnings under €200 will be credited to a member’s account and can be paid to their credit card. Anything over €1,000 will be sent by check or bank transfer fewer bank charges. Okay – what happens to the amounts between €201 and €999? That’s not all they don’t talk about. The terms and conditions are minimal including discussing how to stop playing. Supposedly, a player can opt out and have any unused subscription money they’ve paid refunded. It doesn’t say how long this takes or whether there are any service charges. 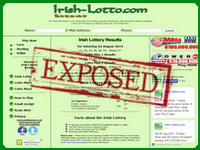 Irish-Lotto.com is owned and operated by Irish and UK Subscription Service. They also run a sister site called Irish-Lotto.net and should not be confused with Irishlotto.net. That’s a different lottery service provider. They are based in Ireland. Irish-Lotto.com offers a snail mail address, telephone number and email address for customer questions. There is no live chat, and we’re not sure how long it takes to get an answer back from their email address. The first issue at looking at Irish-Lotto.com is the fact they have a complaint about scam artists that are using their name. Between that and various other sites that use a combination of the name, it is hard to get behind to see if anyone has said don’t play here. It took a while, but there doesn’t appear to be any actual complaints. I’m not sure about the rest of you, but if I am going to use an online lottery provider, I would like a bigger selection of lotteries I can play. I also don’t want to be patronized by comments like there is no markup on the ticket and the price includes my subscription cost. It’s all the same. What if I win €210? I think I’ll stick with the usual online provider that offers me a broader array of games to play. I have experience with irish-lotto.com. Played with them in the Irish and Powerball draws. The website doesn’t have many bells and whistles, but I did win a small sum (€10). I asked them how I could get my winnings and they gave me several options. Sent by mail, credited to account for future play, back on credit/debit card ect… I chose the credit card option and to be fair, they emailed me and told me it would appear on my account within 2 to 5 working days. It was about 3 days when it arrived in my debit account. Played for about two months and decided to cancel. As you mentioned there was no clear info on how to cancel. I emailed them and said cancel my entry and I received an email about 40 minutes later with what looked like a standard email stating that my entry was now cancelled and I would not be entered into the draw unless I requested it. Overall, I was happy with the service. I hope this helps. Personally, I don’t like lottery providers that make a minimum subscription of 4 draws. i like the option to start with a new provider of one draw to see how it goes. I would also be concerned re their payout – I mean I caught the ‘you get paid within 48 hours’. How do they do it?